What’s all the BZZ About?!?! BZZAgent connects thousands of consumers with the latest and greatest products and services. Become an agent and take advantage of the opportunity to try new products and services and give your honest opinion about them. How Do I Become A BZZAgent? Just Sign Up! 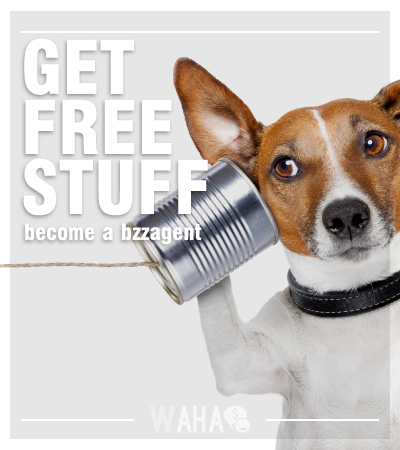 The good news is there is no cost to join BZZAgent. Go to bzzagent.com and remember to visit the site weekly to take surveys. This will help BZZAgent know which campaigns are best for you, and will increase your chances of getting more products! There is often time between joining and your first invite. Sometimes it can take as much as a few months to receive your first invite, but BZZAgent assures that they will not forget about you. Once you have joined, you can visit the BZZAgent Homepage to check out the newest campaigns and take the latest surveys. BZZAgent also offers Agent Training which will help you become a better BZZAgent. What Will I Do As An Agent? BZZAgent will connect you with a product or service, you will try out that product/service and then you will share your thoughts and opinions of it. This can be by Word of Mouth to real-life friends or acquaintances. You can also tell your friends on Facebook, Twitter or even blogs. BZZAgent wants your honest opinion. No scripts are given, but you are asked to let people know that you are a BZZAgent and that the product/service was provided to you. How Much Time will I Spend Being an Agent? Being an agent doesn’t take up very much time. However, the more energy you put into being a BZZAgent, the more benefits you will get from it. Better Agents get better (and MORE) products and services. BZZAgent opportunities are offered to residents in the United States, Canada, and the United Kingdom only at this time. BzzScore is a rating that you are given based on your effort as a BZZAgent. Your score is also based on campaign activities, surveys and your social connection over the last year. Your score can go up or down. The better you score, the more likely you are to receive invites to new campaigns. Declining a campaign invite will not hurt your BZZSCORE, because BZZAgent only wants you to participate in campaigns that are the right fit for you. MyPoints.com (a third-party website) partners with BZZAgent to offer rewards to BZZAgents. They offer 24/7 access to gifts from retailers and restaurants. You must join MyPoints.com and set up an account in order to start earning points. Points can be exchanged for rewards like Amazon Gift cards or some of your favorite retailers. You can earn points as a BZZAgent by completing surveys and select activities in a BZZCampaign. You can also earn Points independently on MyPoints.com. BzzAgent recently did a campaign for men, and gave out many electric shavers. I have been an Agent for over a year with them, now, and have received free groceries, free make-up, free shoe inserts, plus more Great way to earn free product and extra cash. Plus, their steps are easy to follow and fun to fill out! wow! Free electric shavers! I’ve received things like makeup. Bzzagent really is a cool program. I’ve been a Bzz Agent for years now. I go this CAR MD diagnostic tool from them, groceries and many other items that I use daily. Its a wonderful program. It’s very easy to do. The coupons they send out wonderful. I don’t know why this happened but I’ve tried 3 separate times to join but every time I click on the button for my age (55+), I get rejected because it says that you have to be at least 18 🙁 Uhmmmm….clicking on the 55+ button should indicate that you are waaaayyyy over 18, right?